Just a month ago, President Obama delivered a televised back-to-school address to the school children across the nation. At that time he asked them to "put in the hard work it takes to succeed." President Obama knows quite a bit about hard work and responsibility. His job requires both. 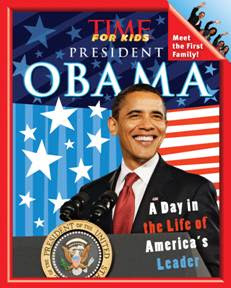 Kids can read about his daily life as President of the United States in the paperback book released this week, TIME For Kids President Obama: A Day in the Life of America's Leader by the editors of Time for Kids Magazine. TIME For Kids President Obama is laid out a bit like a magazine, with eye-catching color photos on each page and short text segments illustrating various parts of the President's day. The book starts with a brief introduction of his journey to the White House, the campaign trail and election day. Kids will love the informative descriptions of the White House complete with rendered drawings and a Washington, D.C. city aerial picture map. Then, going from morning to night, readers are shown behind-the-scenes aspects of the President's daily life. The morning workout, briefing, a sample daytime agenda, family time and staying up late -- President Obama leads a busy life. Besides daily life facts and tidbits, the book is chock full of educational features like a chart of all the U.S. presidents, the order of presidential succession, branches of the federal government and the Cabinet. A short quiz in the back of the book tests readers' knowledge and an alphabetical index directs readers to specific subjects. I really can't say enough good things about this informative yet entertaining book about President Obama. I learned quite a few facts from reading it. Did you know there are 87 phone lines on board Air Force One and that President Obama receives over 40,000 letters a day! The book would make a great gift or possible collector's book for boys and girls, and I think it would be a useful educational tool for schools, especially for kids in the middle grades. It is written in such a way that even those reluctant readers should find it interesting.